Garlic is delicious when young and fresh, as crisp and juicy as a just-picked apple. But store it we must, to last us through the year. It keeps better if strung up, plaited, in a cool, airy place. Most of us buy garlic in corms – known as bulbs – and the best place to store these is in the vegetable crisper. Take off only the cloves you need, as they will stay moister if attached to the base. Contrary to what many people believe, garlic aids digestion. However, once it starts to sprout it loses its sweet taste and juicy flesh, gets stronger and, eventually, develops a rank flavour. It is wise to remove any sprouts in the cloves as these are the bits that can cause indigestion. Garlic can be quite sharp and biting to taste; it can also increase the heat of a dish with its pungency. When garlic is crushed, a chemical reaction takes place as the cells are broken down. Crushed paste or juice is very potent. 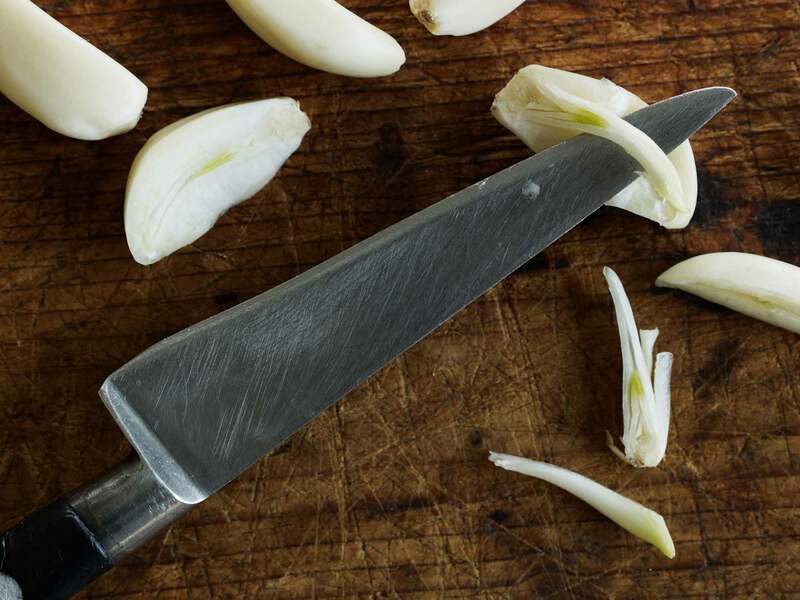 If you want less of a hot bite from garlic, chop it, or if you prefer a milder flavour still, slice it. Garlic is strongest used raw, and mellows during cooking – the longer you cook it, the milder it becomes. 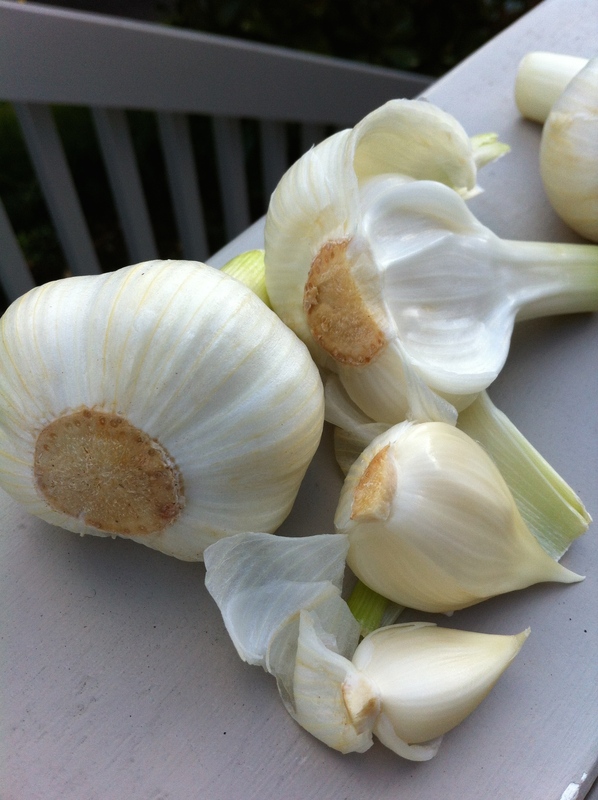 Garlic with smaller corms and purplish skin tends to be the hottest. Basically, the bulbs are leaves which have evolved as storage organs. As the garlic grows, the green leaves can be trimmed off and used as a fresh herb as you would use chives. I use garlic in generous quantities twelve months of the year, but it’s after Christmas that I really go to town when the new season’s garlic is on sale (that’s in the southern hemisphere – in the north, anytime in June, July and August). What will become the papery wrapping around each clove is still supple and a little moist, and the fat white cloves are juicy and mild in flavour. There is no sign of the sprouting centre which is an indication of maturing garlic, and no hint of acridity. You could, if the fresh hot bite of garlic appeals, literally chomp your way through a whole raw clove. Some claims about garlic, such as keeping the spooks at bay, may appear far-fetched, but the belief in its antiseptic properties, its ability to destroy bacteria and how it aids digestion, not causes it, as many wrongly believe, have passed from folklore to fact. And, like most other members of the onion family to which it belongs, garlic protects against heart disease. Recent research claims it helps lower cholesterol levels, too. The trouble is, you need to eat a lot of garlic to get the benefits from it. Well and good. I’m all for using several cloves of garlic a day. I never take garlic pills nor do I use ready-prepared garlic. One of the good things about preparing food, is actually preparing it, not squishing something out of a tube or undoing a jar and spooning out the contents. Unwrapping cloves of garlic is therapeutic to me. 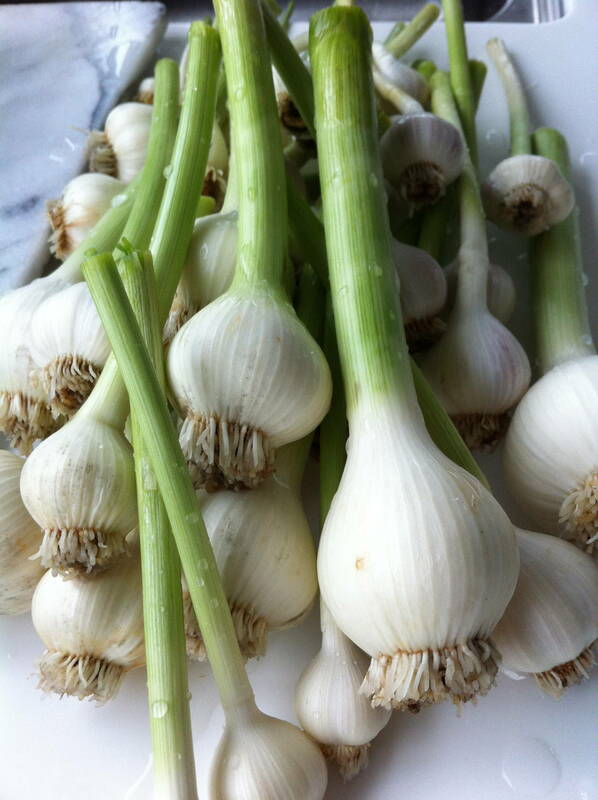 I know garlic is good for me and I know if I buy fresh garlic and prepare it, it’s fresh. The cloves are like intact capsules of goodness, just waiting to be crushed to disgorge their life-giving properties. And like most fresh food, once it is processed and the cell structure changes (ready-prepared crushed garlic, for instance), the goodness seeps away. I’m not a scientist. I just know this. If you want all the goodness out of the food you eat, prepare it yourself. Prepare it fresh. Garlic is easy enough to grow. 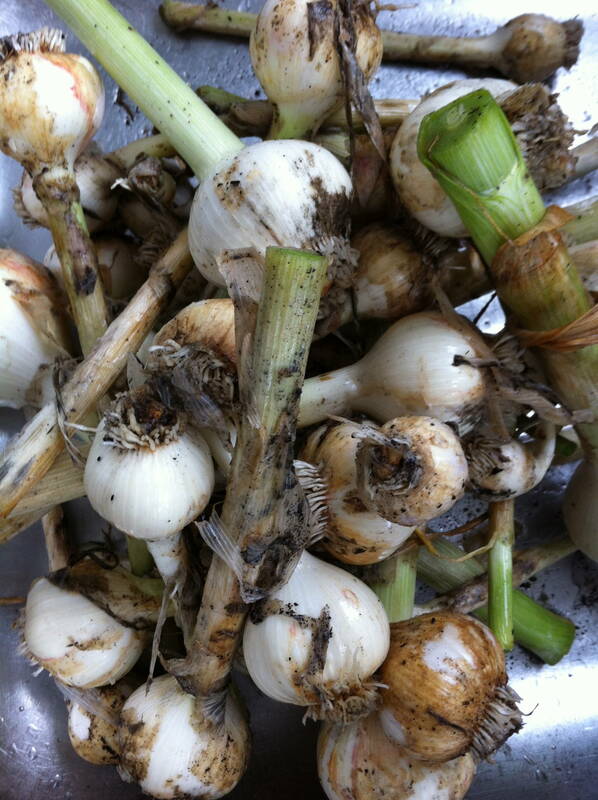 All you need is a handful of healthy bulbs – choose the plump outer cloves from the bulb. You can grow the cloves in deep pots or in an open plot. Plant the cloves upright, about 5cm/2½” deep and 20cm/8″ apart. Each clove produces a bulb. Generally, gardeners recommend growing it in a sunny well drained spot but it would appear that garlic grown in cooler climates is more pungent. Lots of rotted manure or compost is also recommended. It likes a limey soil and if grown by roses each will benefit the other. Someone told me that tying the leaves of the plants in a knot makes the cloves bigger. I can’t vouch for it, but it’s worth a try. The time to plant is either in spring or late autumn, traditionally at the winter or summer solstice (the time at which the sun is farthest from the equator). An autumn planting is considered best because the colder start encourages the plants to put down a sturdy root system which will offer protection from hot weather later on. Keep the plants well watered during their growing period, but ease off on the watering as the leaves start to whither and dry, an indication that the garlic is ready for harvesting. Use garlic to keep the spooks away if you must, but by eating it regularly it seems a safe bet that you will build up resistance to infection. If you suffer from any of the following, whack up your daily intake of fresh garlic and hope for improvement. Oh and take it all with a pinch of salt! Baldness (hopefully ingesting it will do the trick! ); rheumatism (steep it in oil and massage it into the sore bits); bronchitis and catarrh (make a syrup, hold your nose and swallow); wounds and cuts to prevent them turning septic (take a deep breath and apply cut cloves directly on the wound); corns (rub it on…cor blimey, real smelly feet!). Ingesting the cloves should also help prevent constipation, digestive upsets, keep the stomach lining in good condition, ward off thrush, expel worms, ease high blood pressure and keep colds away. As I said, it’s cheaper than the doctor! Roasted Potatoes with Chorizo – Scrumptious! You know these are going to taste spectacular ... so get on to them!